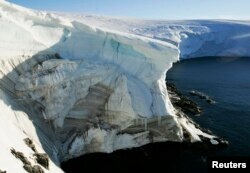 Writing in the Journal of Glaciology, NASA said satellite data showed that the Antarctic ice sheet gained 112 billion tons of ice per year from 1992 to 2001. That slowed to 82 billion tons annually from 2003 to 2008. Over the years, that snow has compacted to become ice, which is thickening at a rate of 1.7 centimeters per year. This is enough to more than offset the loss of ice in other areas of the continent.